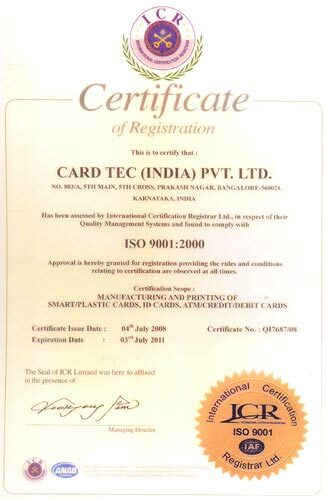 Established in 1996 in Bangalore, India, Card Tec (India) Pvt. Ltd. is a leading company engaged into manufacturing a wide assortment of cards like digital printed cards, plastic cards, plastic identity cards, health cards, ATM cards, scratch cards, smart cards, card accessories, id card accessories, card printers, plastic id card accessories, time attendance and access control, card consumable products, specialty products, etc. We are deal in encoding and embossing and access control systems, lanyards, card holders, yoyos, puzzle cards, and button badges. 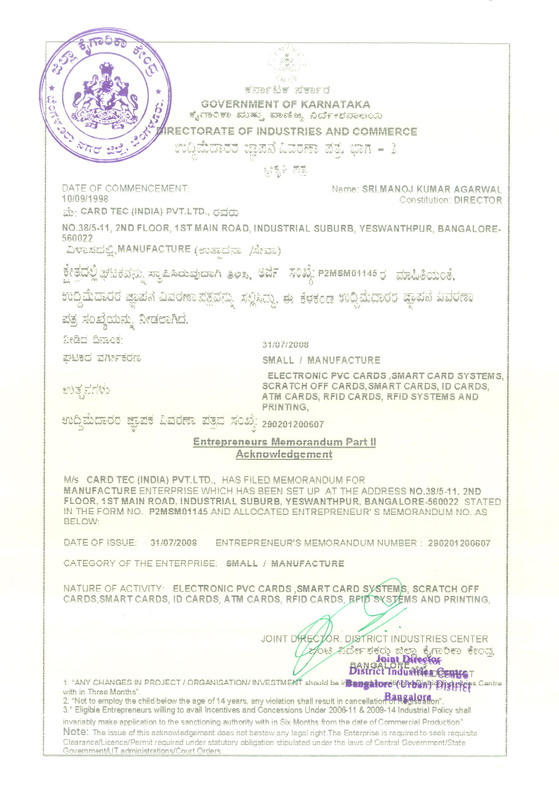 Card Tec (India) Pvt. Ltd. has been catering both commercial as well as consumer markets since inception. We have ventured into partnerships with various reputed companies for scaling new heights. A renowned entity within the domain, we have gained a leading edge in development of plastic cards for identification, access control, security applications, and loyalty programs. 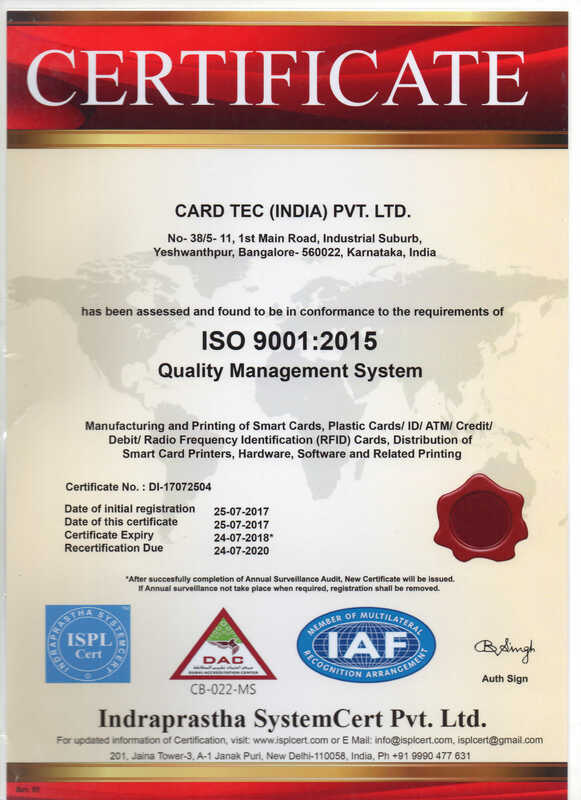 We, CardTec, are an ISO 9001 certified company, and are also certified by NSIC (National Small Industries Corporation, Government of India). 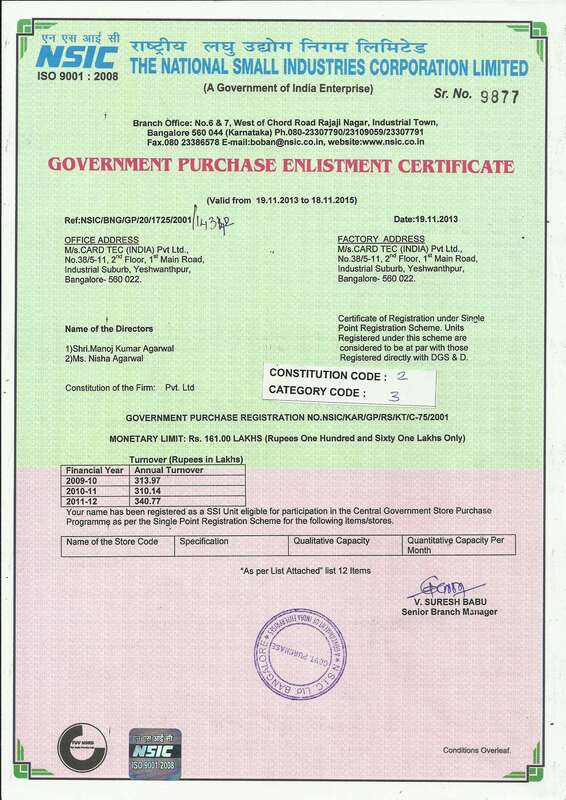 Also, Card Tec is certified by the eminent international audit firm Dun and Bradstreet. Our aim is to impart finest quality products and make on-time deliveries at reasonable prices to our customers. Our target audience is basically the end-users worldwide, who are looking for reliable, safe, and reasonably priced solutions. Our dynamic professionals work uncompromisingly for meeting and exceeding our valuable clients' expectations. We look forward for creating ever-lasting relationships with the customers by providing quality at each step. 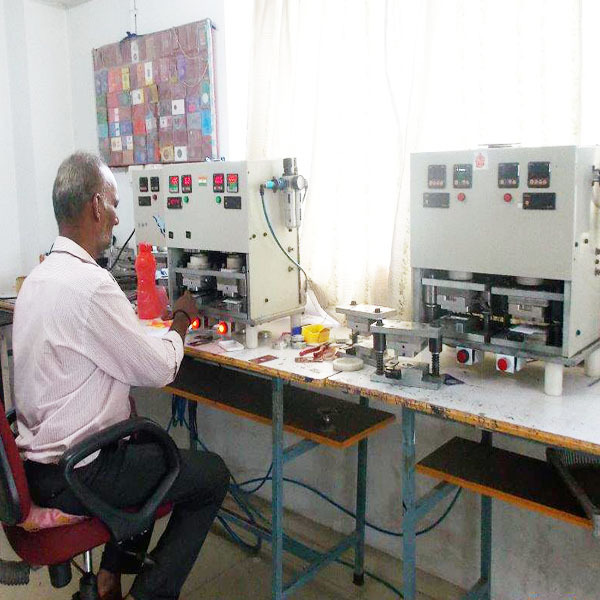 The Card Tec (India)Pvt. Ltd wants to offer you the best products at different locations. We are present in more than 50 locations across the country. With different Locations, you can connect with us easily. The other Locations are: Mumbai, Delhi, Bangalore, Hyderabad, Ahmedabad, Chennai, Kolkata, Surat, Pune, Jaipur, Lucknow, Kanpur, Nagpur, Indore, Thane, Bhopal, Visakhapatnam, Patna, Vadodara, Ghaziabad, Ludhiana, Agra, Nashik, Faridabad, Meerut, Rajkot, Varanasi, Srinagar, Aurangabad, Dhanbad, Amritsar, Navi Mumbai, Allahabad, Ranchi, Howrah, Coimbatore, Jabalpur, Gwalior, Vijayawada, Guwahati, Chandigarh, Hubli - Dharwad, Mysore, Jalandhar, Tiruchirappalli, Bhubaneswar, Salem, Thiruvananthapuram, Noida, Cuttack, Kochi (Cochin), Siliguri, Mangalore. We also Export to these places. Middle – East Including Dubai (UAE), Bahrain, Quatar. Africa Including Nigeria, Kenya, Sudan, Mauritius. South Asia – Nepal, Sri Lanka, Bangladesh, Bhutan.